Send money to any Mobile number or Bank account easily. Enjoy more hassle-free ways to withdraw your cash without the need of an Agent number. Buy airtime for your line and other Telkom customers. Buy Telkom data bundles directly without having to buy airtime. Pay all your utility bills using T-kash directly from your phone. Swiftly pay for goods and services without the need of a Till Number. Imagine a world where all your family and friends are on T-kash. Invite them to join. You are the sole manager of your account. Dial 160 to contact our Customer Support team for free. No more guessing transaction fees! T-kash informs you of our affordable charges before you complete any transaction. 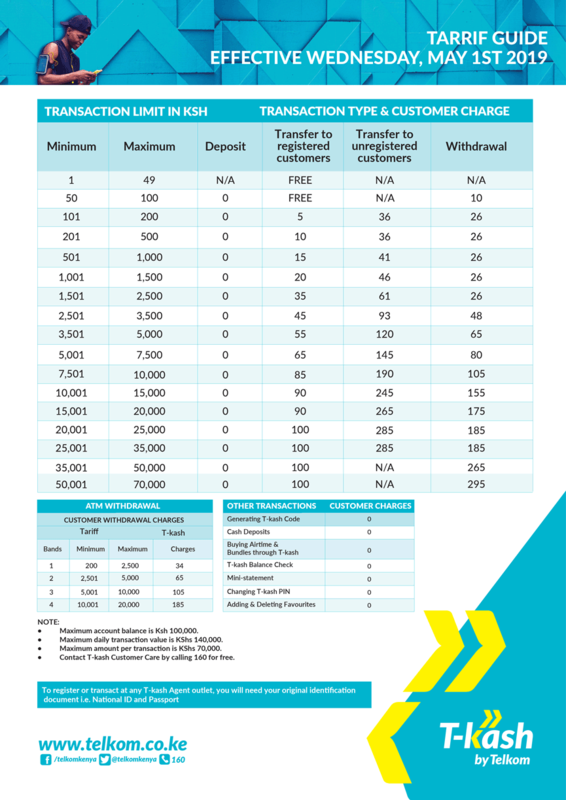 Please see our Tariff Guide below.